Let me preface this post with the disclosure that this coming April I will have been married to my wife for 29 years! Yay for that! It’s truly something to celebrate. So, I’ve been doing this “holiday” travel thing for quite a number of years. However, visiting her blended extended family over the years has had a number of challenges. For a little of that background story you can read a little more here. Also, let me say that we don’t own our own car (huge component of us reaching FIRE) and I’m the only driver. Finally, I have an irrational, but VERY real fear of being killed in an auto accident on the highway. Our recent rental car options (small smart cars) haven’t done much to alleviate that fear. We have a service in our neighborhood called Car2Go. I absolutely love the service and have used it since it was introduced about 3 or 4 years ago. 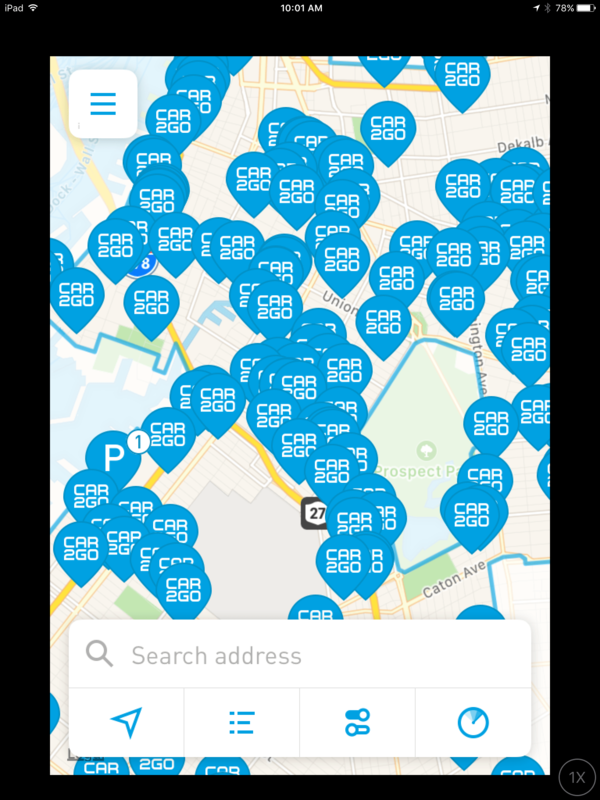 Basically, there are 500 smart cars, randomly parked all over Brooklyn. You gain access the cars via an app, and prices are competitive with ride sharing services, but also offer full day or multi-day rates. When I located my first car of the day, a short walk from our home, I was happy. I wanted to get an early start, so I walked to pick it up around 7:30am. I started the process of unlocking the car, and picking my time option. I figured 2-days sounds like a deal at $139. Maybe get some errands done the day after the holiday. Someone at the crosswalk, near the car, was idling and asked me if I was pulling out. I said I was, and he yelled a “Merry Christmas” to me as I was pulling out…I returned the greeting. Boy if I only knew what a present I was about to receive. As I drove the few blocks to our home to relocate the car, a warning light popped up on the dashboard. “Incorrect tire pressure”. Hmmm, that’s odd, I’ve never seen that before in one of these cars. When I found a spot on our street, sure enough, I found an “almost flat” back tire. UGH! There were few cars available in our immediate neighborhood and they were disappearing quickly, so I needed to decide how to handle this. After returning home, I pulled my bike foot pump from the closet and headed back out to the car with my wife. As I was pumping it, we decided it might be just best to switch cars, so I officially ended that 2 day rental and a summary charge of $167 appeared in my text messages. Greaaaaat. We started our 6 block walk toward…. Looked Ok, after inspecting it from the outside FIRST, but I knew the fuel was a little low from the app. I’d need to stop and get gas before we got on the road. Ehhh.. not ideal, but I’m ok with that. After returning for a small breakfast and showers, (and a 10 minute phone call to get a credit for the aborted rental) we headed back out to our wheels. Now already an hour+ into our new 2-day rental period. Turn the ignition and the car simply won’t start. Second try, it fires up, but immediately shuts off, while the “needs fuel” light flashes. I try about 5 more times and then we start working on a plan as we exit the car and head back to the apartment. “Ok, you walk up to the gas station and see if they have a can they sell that will allow you to hold a gallon of gas.” “Maybe you can ask the neighbors, who have a driveway and garage if they have something.” We’re both doubting any quick turnaround from the rental company. Remember, this is Christmas morning. As we approach our apartment door, I check the app to locate a 3rd car as our back up. There is a nice little “notification message” on the app that says: “We noticed that you didn’t lock the car when you left it, so we “disabled the engine”, click here to “enable” the engine again.” UUUUGGGHHH!!! Ok, so, another crisis avoided and we head back to the car. Boom….now it starts with no problem, but I’m still paranoid that I might run out of gas on the way there…so I step on it. Driving the few blocks to the gas station, I hear an AWFUL screeching sound with the breaks and a feeling like the brakes weren’t fully grabbing. Oh…no. It must just be a one time thing or aberration. NOPE. The next stop light…same LOUD screeching sounds. Ok. 6 or 7 blocks away, but at least we have these wheels to drive there to pick it up, but I’ll need to find a parking spot nearby to drop this one first and close out the rental. When we park in front of this house, the homeowner happened to be leaving and eyeballs us, like we’re breaking the law. “Yes, I’m past your driveway dude.” I’m thinking to myself. He’s already a block away by the time we exit the vehicle. I ended the rental on the app, while I was still sitting in the car. Whoops, I guess you’re not supposed to do that, because after I exited the vehicle a LOUD and annoying beeping car alarm starts going off, at 10am on Christmas morning in Brooklyn New York! I look at my wife and she at me. After 3 burst of the alarm, it stops….and then it starts again! Oh my God! How do I control this thing? Start a new rental? We just walk away, and it stopped on it’s own. Now, it’s 10am and by the time we reach the next car, a few blocks away, I’m mentally spent, plus I still have to hurtle down the highway in a shoe box to see my wife’s family. This time, I simply choose the one day option and let my wife know that we need to be back by 10am tomorrow morning. Years ago I would’ve seethed the entire trip and maybe for days afterward. Now I just write blog posts. Immediately after returning home I got on the phone to get a credit for the second failed rental, which they did with no problem. I’m happy when customer service works efficiently. That’s probably my single biggest criteria for being a repeat customer of any business. Next year, we’re going to return to what we’ve done in more recent years: Just Facetime for 5 minutes. When your partner “goes the extra mile” for you, make sure you take the time to properly thank them and do other things that might make their life a little more enjoyable. You never know when you’re going to hit some potholes in life.